What Promotes Excess Body Fat Stores and Obesity? What promotes excess body fat and health problems associated with these fats are discussed here. This will help you avoid the causes of excess fats and related problems. Age: Excess body fat is more common in young and middle-aged adults, brought on to a great extent by sedentary lifestyle patterns. Menopause: Increase in abdominal fat deposition is favored. Gender: Females have more fat. Insulin resistance: This often develops as obesity develops. Positive energy balance: This is especially important if over a relatively long period. Diet composition: High fat intake, excess alcohol intake, and preference for sugary fat-rich foods are likely to contribute to obesity. Physical inactivity: Low or decreasing amount of physical activity (“couch potato”) affects energy balance and body fat stores. Basal metabolism: A low value with respect to lean body mass is linked to weight gain. Thermic effect of food: This is low for some obesity cases. 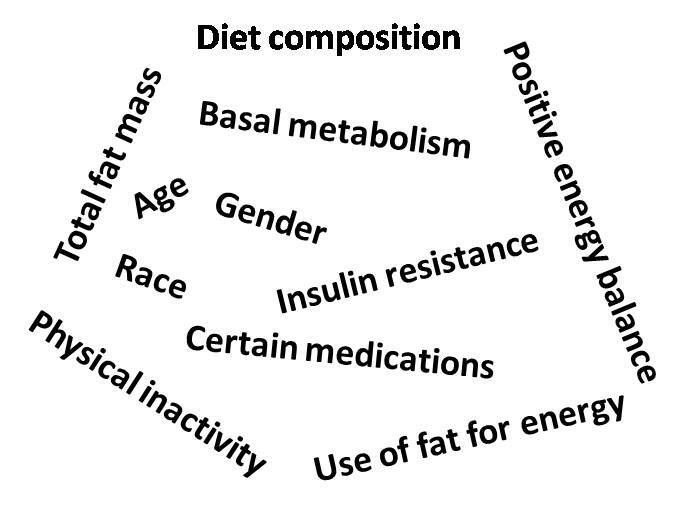 Use of fat for energy: There is limited fat release into the bloodstream. Total fat mass: Leptin, produced by adipose cells, affects food intake. Greater adipose cell mass then eventually leads to greater leptin production. Ratio of fat to lean tissue: A high ratio of fat mass to lean body mass is correlated with weight gain. Fat uptake by adipose tissue: This is high in some obese individuals and remains high (perhaps even increases) with weight loss. Social and behavioral factors: Obesity is associated with socioeconomic status; familial conditions; network of friends; busy lifestyles that discourage balanced meals; binge eating; easy availability of inexpensive, “super-sized” high-fat food (such as in quick-service restaurants); pattern of leisure activities; television time; smoking cessation; excessive alcohol intake; and number of meals eaten away from home. These meals are often served in large portions and are in high fat and energy content. Today, “food hunts man” to a great extent in Western societies. Undetermined genetic characteristics: These affect energy balance, particularly via the energy consumption components, the deposition of the energy surplus as adipose or lean tissue, and the relative proportion of fat and carbohydrate use by the body. Race: In some ethnic groups, higher body weight may be more socially acceptable. Certain medications: Food intake increases. Childbearing: Women may not lose all weight gained in pregnancy, leading to creeping weight gain. National region: Regional differences, such as high-fat diets and sedentary lifestyles in the Midwest and areas of the South, cause different rates of obesity in different places. What Promotes Excess Body Fat- 14 Health Problems Associated with Excess Body Fat. 1. Surgical risk: Increased anesthesia needs and greater risk of wound infections. 3. Type 2 diabetes: Enlarged adipose cells, which poorly bind insulin and poorly respond to the message insulin sends to the cell. 4. Hypertension: Increased miles of blood vessels found in the adipose tissue, increased blood volume, and increased resistance to blood flow. 5. Cardiovascular disease: Increases in LDL- cholesterol and triglyceride values, low HDL-cholesterol, and decreased physical activity. 7. Gallstones: Increased cholesterol content of bile. What Promotes Excess Body Fat- Health Problems Associated with Excess Body Fat. 8. Skin disorders: Trapping of moisture and microbes in tissue folds. 9. Various cancers (e.g. breast, colon, pancreas, gallbladder): Estrogen production by adipose cells; animal studies suggest excess energy intake encourages tumor development. 11. Pregnancy risks: More difficult delivery, increased number of birth defects, and increased needs for anesthesia. 12. Reduced physical agility and increased risk of accidents and falls: Excess weight that impairs movement. 13. Menstrual irregularities and infertility: Hormones produced by adipose cells, such as estrogen. 14. Premature death: A variety of risk factors for disease, listed above.